The amount of collective action in a learning system is inversely related to the possible degree of curricular specificity. The mathematical action of a group of learners centred on a particular task gives rise to a unique way of being with the problem, but also reinvents the problem. In short, what emerges from collectivity is not tidy. How can I justify curating a collective of learners, when school is so interested in individuals? Learners commerce on a central path of mathematical learning while acting on a problem, but each take away personal, enacted knowings from the process as well. Collective consciousness grows as agents interact, but we live in a system that values individual learning–often in a very narrow sense. Although I cannot be sure where the problem will go, students will become more mathematical by acting on it. This wondering has been pushed to the forefront of my thought by two events today. First, a Skype call with a graduate supervisor regarding the nature of collective consciousness and its relation to the outcomes-based school system we teach in. Second, a moment of personal significance from a Grade 11 class on quadratics. I anticipated students beginning their table with “x= -3” because the values -3 through 3 were commonly used in our study of linear functions. 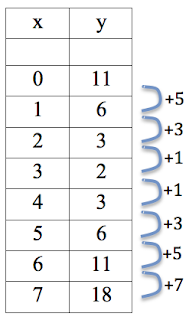 I purposely gave them a quadratic that returned large numbers for the first few inputs. I watched as the groups began organizing themselves around the task. It wasn’t long until each group developed a personality. Some groups divided inputs among themselves, and built a joint table of values. Others worked through the arithmetic together. Conversations around input choice and error correction began as their pattern-finding skills took over. Why is that so big? It won’t fit, so change the scale. The square is making everything too large. The large output values perturbed the groups’ thinking. Some handled it by changing the scale while others chose inputs that made the square as small as possible. I wanted groups to do the latter, but some resolved the problem as a matter of scale. They changed the problem, and I gave them the licence to do so. I wanted them to get at the idea of a vertex, a lowest point, or a turning point. I asked them why the graph was turning around, and because they had been given the opportunity to experiment with choice, they knew that the exponent was creating positive outputs from negative values. This was perfect. It was exactly what I wanted them to get out of it, and I had harnessed collective action to get there. It was this moment that I pulled out my phone and wrote this quote down, because it clicked. She had described differential calculus. I took the time to act collectively with my students and it couldn’t have paid off more… for me! They didn’t know it, but I pulled an extremely valuable individual knowing from our collective knowing. They centred their group work on the idea of change. From there, they looked at the symmetry of change and how it created a parabola. This is valuable work. Each had encountered the math and created personal coherence from the task as well. Where these personal knowings landed, I could only assume based on our interactions. For me, the personal knowing was centred around the connections between tables of values and calculus. The pattern they showed me occurred because the rate of change of a quadratic function is not constant, but does grow constantly–linearly. I had pulled the idea of a first derivative from a lesson on introductory quadratics. Circling back to the point of the post: I saw great learning from the groups. It wasn’t all identical, and that enriched the fabric of the lesson (and the intended aims). From the space opened for collectivity, I pulled out a personal meaning–one deeper than I ever would have anticipated. This is the very essence of education. In a system obsessed with individual scores on specific competencies, we lose sight of the fact that deep meaning is pulled out of collectivity. It isn’t one or the other. Curating a collective consciousness in the classroom allows students to build understanding in context as they change their problems with their actions on them, but that doesn’t preclude them from creating powerful, personal meanings. The episode provides an illustration that even though collective student action softens control on what students digest mathematically, it doesn’t mean that the classroom events provide only group knowing and lack personal meaning.